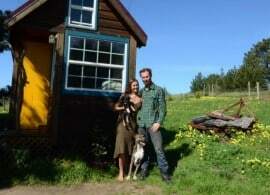 These days I see more and more couples in the middle of building a tiny house together, or in the early planning stages, figuring out what each of them needs to be happy. Adopting this lifestyle and sharing a small space together can be an incredibly rewarding and challenging experience. But I’d also say that it’s not for the faint of heart. Especially if building a tiny house yourself, it will test you and require more of you more than ever knew you had! That’s true both in the physical and mental aspect of planning and building, but also in the emotional and psychological aspect of working together, communicating honestly in each moment, and learning to live harmoniously in close quarters. Does that sound grim to you? Don’t worry. It’s not. The truth is, sharing a small home (and working together to create it) can also lead to some of the greatest learning experiences, improved communication, increased intimacy and sharing, and an overall peace and satisfaction of living in a space all your own. 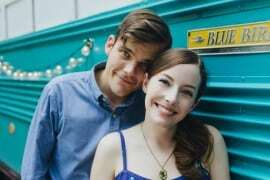 To put it another way, living in a tiny house with your partner will NOT make your relationship better or worse, but I’m willing to bet that it will intensify it either way! 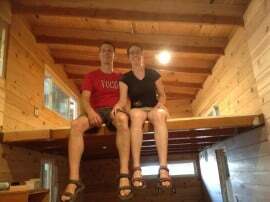 So how can you insure that this tiny house idea can help strengthen your relationship, not hurt it? Here’s my advice. Backstory: Until separating recently for reasons completely unrelated to the tiny house itself, Anjali and I lived full-time together in our 160 sq.ft. home for about a year and half. Here are some of the factors that were really important to us discovering how best to live happily together. Just passing each other in your narrow “hallway” is a more intimate dance that you may be used to! Cooking together in a tiny kitchen is the same, or sharing a small sofa to watch a movie on a smaller laptop or iPad screen. Ask yourself: How comfortable are you in close proximity with someone all the time? In your experience, does more time together increase your “polarity” with your partner, or decrease it? Do you need a space that is all your own, your “me” spot, not to be disturbed by your partner? Do you work at home or have other needs for creative/play space? We both worked at home and found that we were both more productive when we spent part of the day working out of the house. Sitting a few feet from each other all day long is both a blessing and a curse! Again, ask yourself: Are you happier when you can spend more time right next to the one you love, or are you happier when you are away for a while and then come together more intentionally for part of the day to connect? Get clear on these answers BEFORE you start this process. 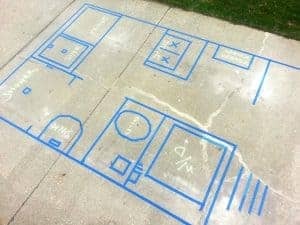 Try this: Use chalk or tape to mark out a floorplan on the ground first, and test how each of you move within that space, or how it feels when you are both sitting, both cooking, etc. Make adjustments to be sure you are comfortable in each situation. Maybe you realize it’s too large and you actually want to be closer together! Or maybe you realize that you “hallway” is too narrow and you want to be able to pass each other more easily? Build a deck to add more usable outdoor living space, maybe for BBQing, to eat meals, do yoga or exercise, or as place to work or read in the sun! Read more about our fold-up deck. 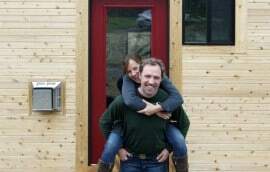 Some tiny house couples I know have “his” and “hers” houses, knowing that they’d each be happier with their own space, but with the ability to come together easily whenever they wanted. Consider pocket doors, curtains, other dividers to create more privacy and separate space when needed. Some of us are more introverted and loners, some extroverted and social. More introverted than extroverted, Anjali and I both value time to ourselves. Once this became more apparent as we started living tiny, we had to learn to communicate this need for time, and then negotiate for times both morning and evening during the week that one of us would leave the house to give the other this essential quiet time at home. I’d often head to the gym, or to a friends house, or out to a movie, to give her other time for self-care, a “girls night” at home with our dog, or time to meditate, journal, or have a private tiny house dance party! Are there times of day or days per week that you are used to more alone time? Try this: Work together to create a time log, outlining your weekly schedule and the times you value both together and apart. Design your house and tiny house lifestyle to meet these needs, but also be flexible if you realize your needs change once you get in your house! Once living in a tiny house for a few weeks and months we slowly saw our needs shifting as we got used to the smaller space. With more time together in close proximity we both also began to realize the increased importance the time that we spent apart! When there’s a conflict in a tiny house, or even a normal conversation, you may find that the smaller space can intensify this communication. This can also be positive, making an intimate moment even that much more special, reverberating off the close walls of your loft. But most tiny houses have no separate rooms, so if you argue, there is no door to slam, no spare room to shut yourself in. Unless you want to head outdoors for some fresh air (a great idea!) this means facing anything that arises head-on! To me, that means being open and receptive, even if feeling hurt or offended. That’s not easy! This can be challenging at first, but it also helps us learn some amazing new communication skills, and in my opinion greatly increases empathy. Personally I’ve learned to communicate my own needs much more honestly and clearly, and also to anticipate the needs of my partner much better. I find myself taking things less personally now, realizing that what my partner needs to be happy does mean she loves and values me any more or less. Practice: Don’t wait until you share a 160 sq.ft. house to practice communicating this way. As you start planning to your tiny dream home, practice being very clear and honest with each other and do your best to really listen to your partners needs before jumping in to share your own. Listening is key. Finding out now what will and won’t work is much better than finding it out only after the fact, once it may be too late to make changes. Don’t try to squeeze your partnership or your lifestyle in a box that doesn’t fit. 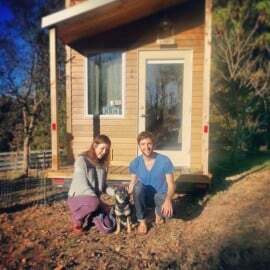 Are you dying to build a tiny house, but your partner thinks it’s crazy? Make sure you’re both on the same page – Not just with the smaller physical space, but the lifestyle it will encourage. That means downsizing clothing, toys and maybe doing without some conveniences you are used to — can you say composting toilet? Do you have similar habits when it comes to organization, cleanliness, and style? With a large house to spread out, differences are less noticeable, but when you share the same single room, keeping the space tidy (or messy) can have a much larger impact on your significant other. 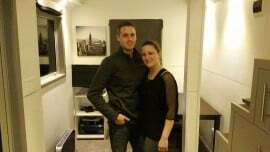 If your partner likes order, do your best to learn as best you can his or her ways. Your house should serve your relationships, your larger life goals, and enhance your interaction with friends and your community. Do you and your partner share similar goals? Maybe not? Being in a smaller space may help align your goals and desires, but it may also shed light on the ways you are different. Support each other despite these differences! Living happily in a smaller space means finding out what activities both in and outside the house will make you fulfilled. Supporting each other in the pursuit of your chosen activities, sports or hobbies is key to making this lifestyle work long-term – key to any relationship, tiny or otherwise! 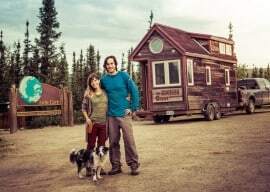 Try this: Before you seriously consider a tiny house as an option, write down your goals (and desires to learn and grow), both individually and as a couple. 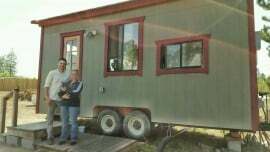 See if and how a tiny house can help you accomplish these things. 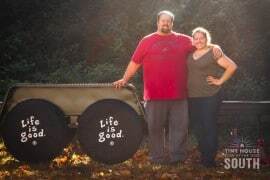 Are your goals financial, for more freedom and self-sufficiency, more mobility, more connection to nature or greater intimacy with your partner? Any of these, and countless others, may be reason enough to go tiny! Maybe you want to save for grad school or to pay off your debt? Maybe you want to minimize your environmental impact by decreasing your use of water/power and your production of waste? These goals tend to hand-in-hand with tiny living. But maybe you are an avid outdoorsman with three bikes, two kayaks, and other toys for every season? Or maybe you are a painter who need a large studio space to create her best art. 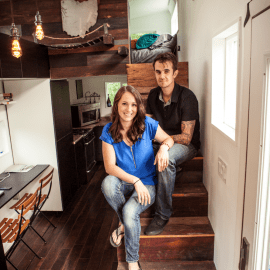 While there are plenty of ways to live in a small house and find other spaces for storage or activities, maybe in these cases a tiny house is actually NOT the best way to support your chosen lifestyle both individually or as a couple. You don’t want to move into a tiny space only to feel confined and resentful, putting a strain on your relationship from the start. 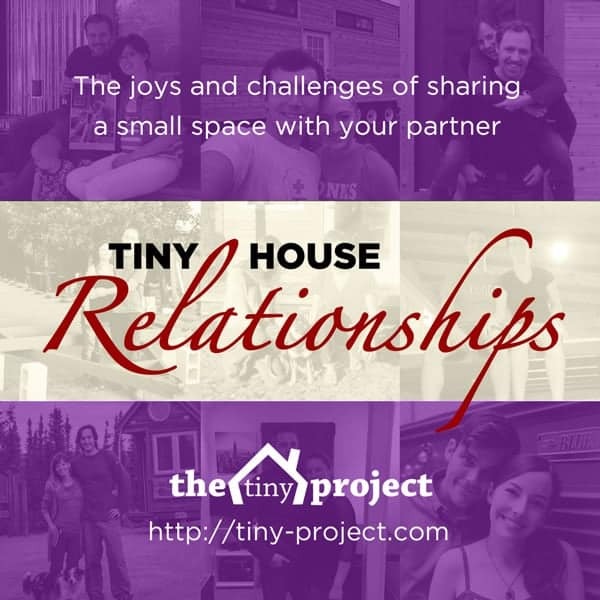 So, the message I’d like to share today is, if you’re in a relationship, think carefully about what you and your partner will both need (in the physical structure of the house itself, but also in communication, alone time and private space) so you can set yourself up for the best possible tiny house living experience. Here’s more about some things we considered. 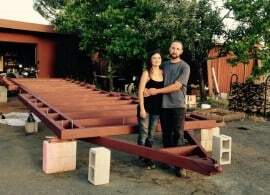 I know some tiny house couples who are happier than ever spending nearly every waking minute with their partners. I know others who have separate tiny houses, understanding their own need for private space and alone time. I know some who keep their tiny house perfectly clean and tidy, knowing that their house serves as their peacefully refuge amidst the stress of their jobs or other affairs. I know still others who embrace their artistic, often chaotic messiness, living in a way that enhances their creativity, fully in line with their sense of style. Each couple is different and each individual is different, but in a very small space, we will all inevitably have to deal with the core issues of physical space, time spent together and alone, and the interplay of each of our goals and desires in life. 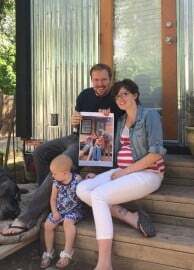 Tiny houses bring all these aspects to the fore, giving couples the amazing opportunity not only to live self-sufficiently, comfortably, and affordably, but also to learn the true gifts of honesty, openness, listening and mutual support. You can’t take the good without the bad, the fun without the challenge. 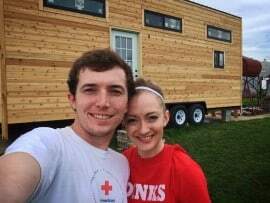 But if you want it all, and are ready to do it together, then tiny house living might just be the perfect thing not just for your housing needs, but for your relationship as well! Best of luck to all you taking this amazing journey together! Alek! I really enjoyed this post, many good points made. It’s been an intense year getting married, losing my father in law and now beginning this next step together. Clear and positive communication has been invaluable for us. Taking the opportunity to work as a team has been a great bonding experience, especially since Tim father was a woodworker. You never know where life will take you, living for the present day and appreciating where you’re at is a good lesson to learn. We are learning more everyday! 😉 thanks for the post!